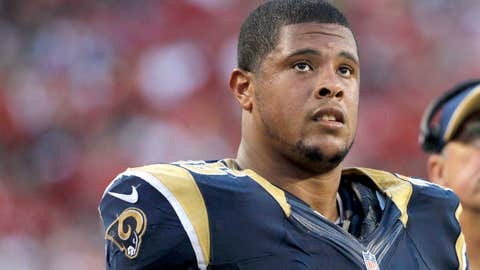 Rodger Saffold's season-ending shoulder injury opens the door for Garrett Reynolds. Garrett Reynolds will be a man on the spot when the St. Louis Rams return to action following this week's bye. With Thursday's announcement that right guard Rodger Saffold will be undergoing season-ending surgery, Reynolds will move into the starting lineup when the Rams host the Cleveland Browns on Oct. 25. Reynolds acquitted himself well after replacing an injured Saffold in the first quarter of last weekend's loss to the Green Bay Packers, drawing praise from head coach Jeff Fisher for helping to stabilize an offensive line that had been shaky to that point. The 6-foot-7, 305-pound Reynolds, in his seventh season overall and first with St. Louis, has played both tackle and guard in his career and started 27 of a possible 57 games with the Atlanta Falcons, Detroit Lions and Rams. HC Fisher announces Rodger Saffold will undergo season-ending surgery on shoulder and has been placed on IR. Garrett Reynolds will start in his place at right guard.